Protecting plants – save bees! Bees live in a dangerous environment. Many factors make their lives difficult. These include, the Varroa mite, which attach themselves to bees, and, unfortunately, some pesticides. Consequently, it is very important when using plant protection pesticides that they do not harm bees. Guidance on how to do this is always noted on our product packaging. At Neudorff we make sure that our products, when used properly, protect and conserve bees. Too little food, especially in autumn and winter, when there are not enough flowers available. The introduction of the Varroa mite from Asia. These mites feed on bees’ bodies and can eradicate whole hives once they establish a foothold. 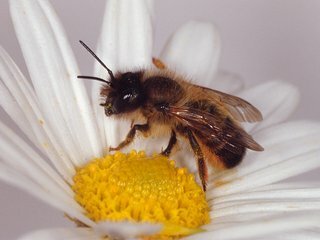 Some pesticides harm bees by causing them to lose their orientation and making them unable to return to their hive, therefore starving their larvae. 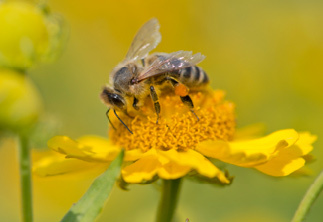 Bees must find enough flowers that provide them with pollen and/or nectar. Unfortunately these flowers are often not available in domestic gardens. Therefore help the bees and plant bee-friendly species and varieties in your garden. The following plants are all good for bees: mallow, catmint, phacelia, tagetes, corn, sunflower, asters, dahlias, herbs anemone, crocus, sage, globe thistle. However, only the single headed flowers deliver the coveted bee food. Double flowers are worthless for flower visitors. 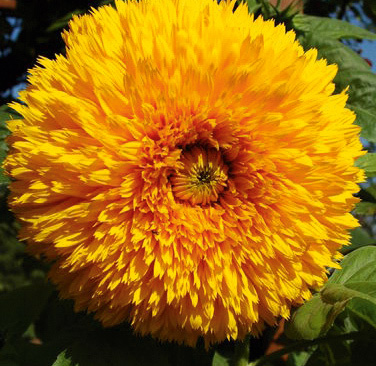 In double flowers the stamens are converted into petals which prevent them from providing pollen. 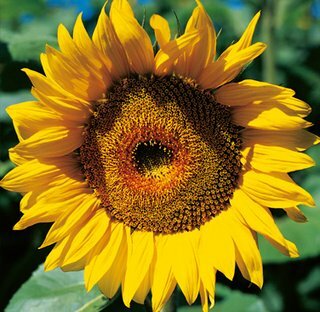 This sunflower has plenty of single flowers and will therefore provide a large quantity of food for bees. Carefully spray only the plants that require treatment. Do not spray during rainfall as the efficacy of the product will be reduced and reapplication will be required. Do not spray in windy conditions as this greatly increases the risk of drift onto non-target plants and creatures. Only treat plants at temperatures below 25°C. Dilute residues with water at a ratio of 1:10 and apply it to the previously treated areas. Rinse all equipment after use and dispose of the rinse water responsibly. For those who prefer an easier solution try a ready to use pre-mixed product. Store products in a dry, frost free environment. 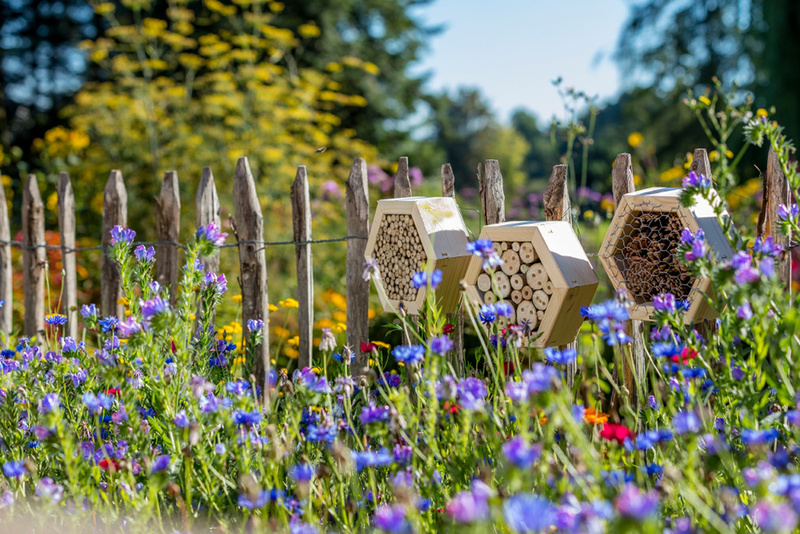 Gardeners who use bee friendly plant protection products do much to protect these amazing creatures who are essential for the continued balance of our natural ecosystem. During the winter bees survive as a colony with their queen. However, there is no brood during this time. They form a winter cluster and warm each other by tiny muscle movements. Once the first warm days of spring arrive the bees are active again, and the queen recommences laying eggs. To supply the egg-laying queen and the brood, the bees travel tirelessly and collect pollen and nectar from flowers. 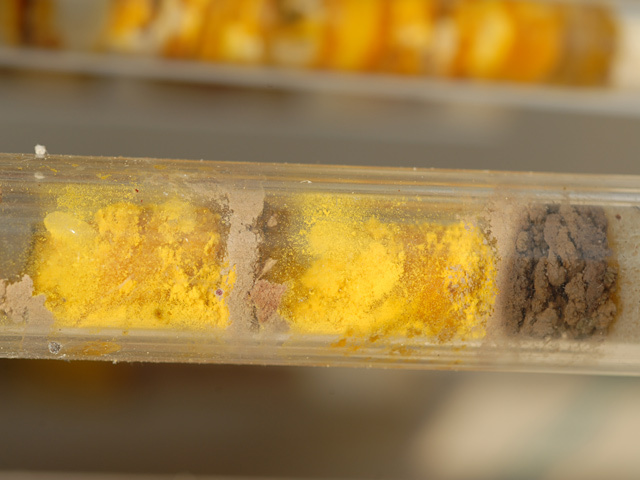 This pollen is transferred unintentionally to the pistils of other plants and pollination takes place. Most of their nectar they give back to the hive. To make it in to honey bees consume and regurgitate it several times which thickens the honey and makes it durable. Therefore honey is practically predigested and as a result its energy is released rapidly into the blood when consumed by humans. To carry the powdery pollen into the hive, the workers take honey from the floor of the hive to act as a ‘glue’ for the pollen to stick to. They then gather clumps of pollen and paste it onto their legs which have special depressions to allow for the ‘pollen loads’ to be carried. Even wild bees are industrious pollinators. 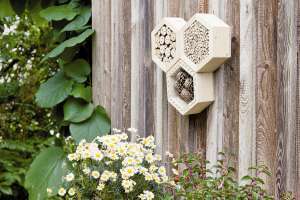 They are not communal like honey bees, but usually live alone - laying their eggs into hollow plant stems, bark crevices or in Neudorff’s Insect Hotel. Neudorff’s Insect Hotel is a great way to make visitors feel more welcome in your garden: wild bees find a cozy home and will be joined by butterflies and ladybirds seeking a place for winter hibernation. Read more about the fascinating life of these busy garden helpers in this guide. Insects are, like many other animals and plants, essential for maintaining the ecological balance in nature. Wild bees’ contribute by pollinating of our fruit trees, the importance of which is often underestimated - a single mason bee can pollinate as many blossoms as 80 to 300 honey bees! 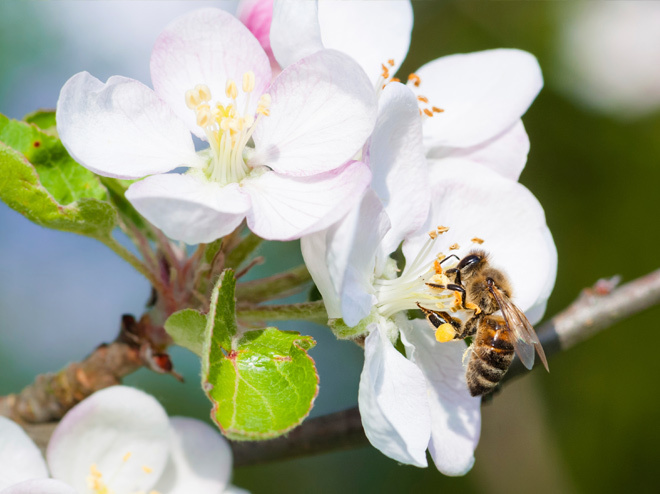 (shown by studies on apple and plum trees) With their pollinating activities, wild bees ensure the harvest of apples, strawberries and many other fruits. Without this pollination, not a single fruit could develop. 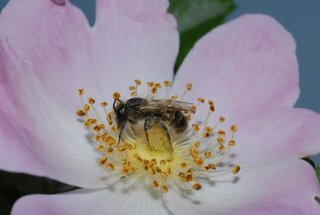 Wild bees are increasingly important as there are less and less beekeepers and thus less and less honey bees. Therefore, the protection of wild bees is not only for the environment’s sake, but also for the benefit of all gardeners! Wild bees have a sting, but it is far too weak to penetrate human skin. In actual fact, the insects are very friendly, so that they can be observed in the garden quite safely. 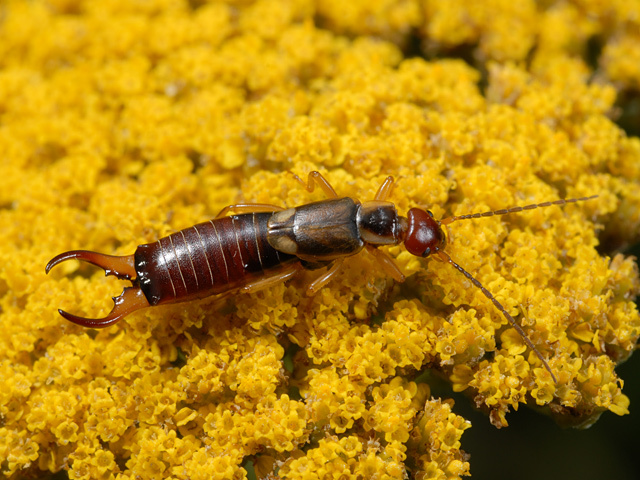 Beneficial insects like ladybirds, green lacewings, and earwigs fight many pests in the garden. They feed on aphids and other small insects. By doing so, they contribute to biological plant protection and ensure that you need to use pesticides much less frequently, thereby reducing your gardens impact on the environment even further. In an untouched natural environment insects don’t need any aid for subsistence but in today's highly modified, cultivated landscape, and also in many gardens, beneficial insects find very little shelter. 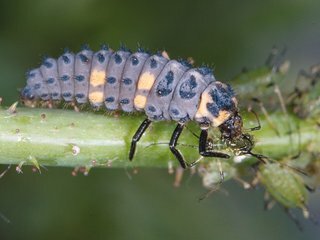 Many gardens are manicured and dead trees and branches that provide the necessary shelter for beneficial insects are becoming hard to find. In autumn many gardeners rake the leaves from the beds and leave the soil without any cover during the winter. This means certain death for ladybirds and other insects as they usually survive winter under leaves and in other safe hideaways. 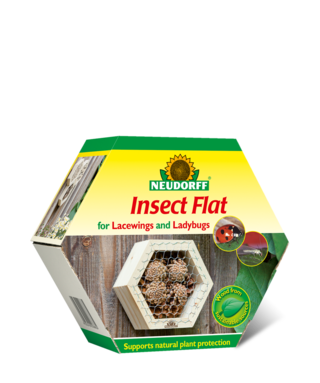 In Neudorff’s Insect Hotel, many beneficial insects like ladybirds and green lacewings find shelter and nesting sites. 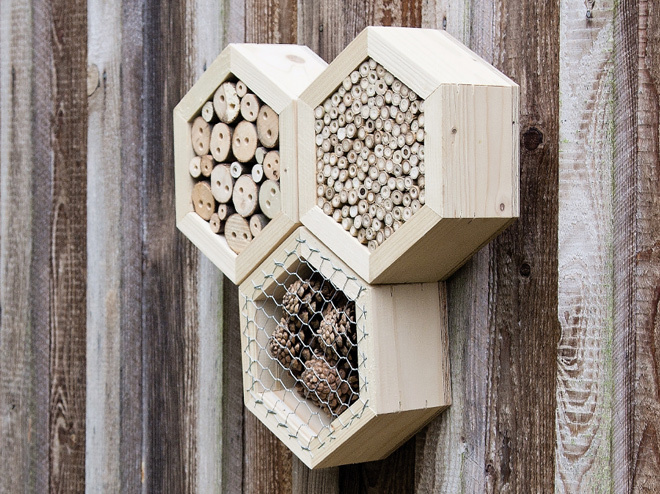 Therefore by hanging up an Insect Hotel you are making a valuable contribution to the protection of nature. At the same time the residents of the Insect Hotel help you with biological plant protection by devouring aphids and other pests. And finally, the hotel gives you the great opportunity to watch the insects with your children or grandchildren. There’s no risk as the wild bees don’t sting. You can watch the wild bees inhabit the holes, take food into them and finally close the openings. This is more exciting than many TV shows! For the additional protection of insects, we have an important request: please don’t tidy up your garden too much and instead help insects find shelter in amongst the undergrowth. Where insects feel at ease, larger animals like birds, hedgehogs, shrews and other garden inhabitants will also like to stay. Turn your garden into a little biotope - even the smallest space can help many animals and ensure the natural diversity of our flora and fauna. 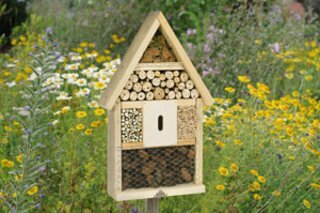 The Insect Hotel should be hung up in a sunny place that is sheltered from wind and rain, preferably facing a southerly direction (SW, S, SE), between 1 to 2 m from the ground, as a minimum it should sit above surrounding vegetation. It can be fixed on the wall of a house or garage, a fence or a tree post. Ideally, there should be nectar and pollen rich plants located near the Insect Hotel. 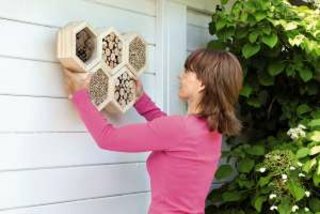 Even on the 5th floor of a high-rise city building wild bees and other beneficial insects can settle in the Insect Hotel. 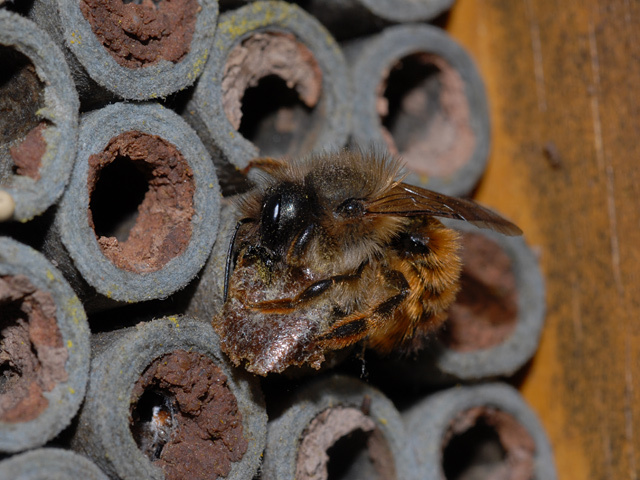 The wild bee Osmia Rufa, which is very common, likes to nest in cavities and settles in the drilled pieces of wood and plant stems with a diameter of about 6 mm in the Insect Hotel. Other, smaller wild bees share the hollow plant stems of a smaller diameter with digger wasps like face-masked bees (Hylaeus species) or scissor bees (Chelostoma species). In our latitudes, the Red Mason Bee can often be encountered. It hibernates as an adult animal in hollow plant stems or other openings. From March to June, the wild bees leave their hibernation sites to mate. The females then look for a suitable hiding place to lay their eggs, like for example a hollow reed. Inside it, she builds a back wall made of mud and saliva. In front of it, she stores pollen and nectar, the food for the wild bee larva that will soon live there. 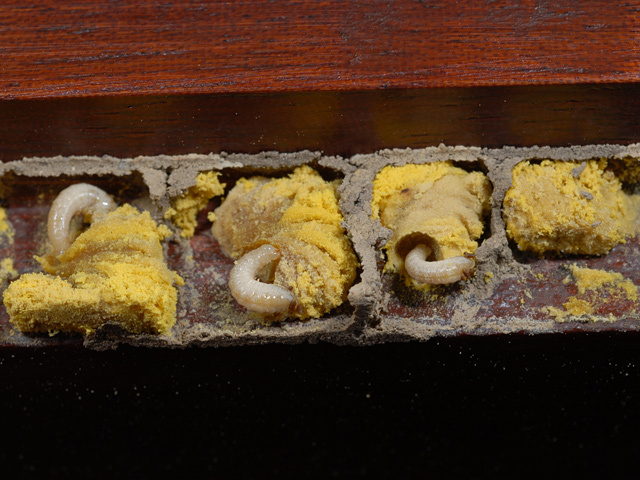 Once this brood cell is sufficiently filled, she lays an egg onto this food padding and seals this first brood cell with clay and saliva. She continues like this and is able to build up to 10 brood cells in a row. For the construction of a single brood cell, the appropriate storage of food and the oviposition, the female needs about a whole day! A fascinating thing about this method of laying eggs is, among other things, that the Red Mason Bee fills the first rearward cells with fertilised eggs from which females will develop as they need a longer time for their development and therefore hatch later. From the unfertilised eggs that have been laid in front, males will hatch which develop quicker and therefore hatch earlier. One or two weeks after oviposition, the larvae hatch from the eggs and feed on the food supply in their cell for two to three weeks. During this time they shed their skin several times. Then they spin themselves a cocoon in which they transform into a pupa. In late summer, the adult insects hatch and hibernate in the Insect Hotel until the following March. Nowadays, spaces like these are hard to find – but everybody can do something to help wild bees find more nesting and hiding places again. 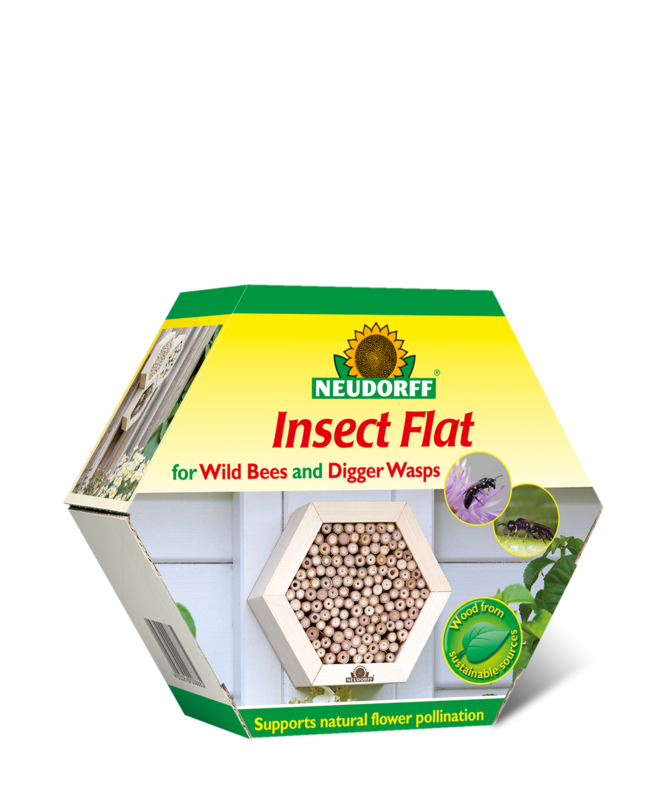 Provide at least one Neudorff Insect Hotel in your garden. Leave dead trees and shrubs in your garden. Take old tree trunks into your garden in which wood-inhabiting insects can nest. A dry stone wall with its numerous crevices offers many great nesting opportunities. Plant appropriate feeding plants (see table). Only use plant protection products that disturb nature as little as possible (e.g. from Neudorff). Don’t cut back perennials in autumn, but only in spring, when the first new growth can be seen. Mix soil with sand and / or gravel in a small, sunny spot in your garden for ground-dwelling insects to find a suitable habitat. Leave sand and gravel surfaces open for the ground-dwelling wild bees. Arrange any small rocks that you find in beds into stone piles. Build heaps of dead wood. Leave perennials in your garden over the winter. Not only will birds peck at the seed stands - in the hollow stems a lot of wild bees and other beneficial insects will hibernate. Wild bees collect pollen and nectar from blossoms. But not every flower supplies pollen. There are many kinds that are completely worthless as food for insects. These are mainly double blooms, as here the stamens have been transformed into petals by intensive breeding. These double blooms, e.g. on dahlias, sunflowers or roses, often look impressive with their big and splendid flower heads, but they provide no pollen or nectar. Wild bees, butterflies or hoverflies will not find any food in them. In addition, these double blooms can’t form any seeds. Birds in winter will also not benefit from these plants as they won’t find a single seed grain to eat on them. Another big problem for many pollinators is the fact that in certain times of the year they don’t find any food at all. In spring and early summer, everything is in bloom. From crocuses, grape hyacinths to blooming fruit trees, there is food in abundance. But what is still in bloom during summer? Walk through your garden attentively – what blossoms can you find in July and August? 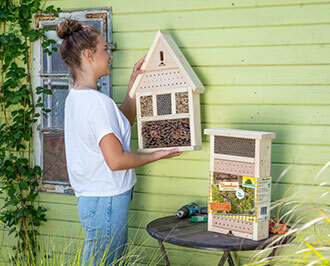 With only a few flowering plants, you can help a lot of insects over the year. autumn squill Scilla autumnalis Sept. to Nov.
blue daisy Jasione montana June to Aug.
blueweed Echium vulgare May to Aug.
canary creeper Tropaeolum peregrinum June to Oct.
caraway Carum carvi May to Aug.
coffeeweed Cichorium intybus June to Oct.
common bird's-foot trefoil Lotus corniculatus May to Oct.
common lavender Lavandula angustifolia June to Aug.
common toadflax Linaria vulgaris May to Oct.
english marigold Calendula officinalis June to Dec.
feltwort Verbascum thapsus July to Sept.
gentian Gentiana germanica May to Dec.
harebell Campanula rotundifolia June to Oct.
hyssop Hyssopus officinalis July to Aug.
large pink Dianthus superbus June to Oct.
lemon thyme Thymus pulegioides June to Oct.
new england aster Aster novae-angliae Sept. to Nov.
new york aster Aster novi-belgii Aug. to Nov.
proliferous pink Petrorhagia prolifera June to Oct.
saffron crocus Crocus sativus Sept. to Nov.
silver thistle Carlina acaulis July to Sept.
smooth blue aster Aster laevis Aug. to Nov.
starflower Borago officinalsis May to Sept.
woodland sage Salvia nemorosa June to Sept.
yarrow Achillea millefolium June to Oct.
By using the Insect Flats, every nature lover can create their own unique insect wall. The variety of nesting materials in our three different housing cells is geared to the specific nesting and hibernating needs of the various beneficial insects described above, whether it be in the garden or on the patio or balcony. This way you can help nature – and at the same time benefit yourself and your garden. These wooden nesting cells are made of local, untreated wood. Each pack contains one set of nesting cells plus three matching connectors. The cells are filled with different types of material and can be easily assembled in a few simple steps with the help of the connectors. 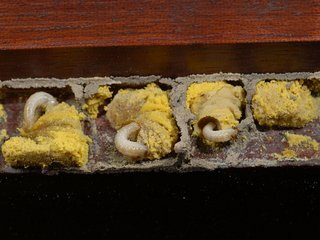 In this way, you can create your own unique insect walls, which can be complemented and extended at any time. These nesting cells contain pine cones, which are particularly suited as a shelter for ladybirds and lacewings over the winter months. Both of these insect species play a beneficial part in biological plant protection, especially against aphids. 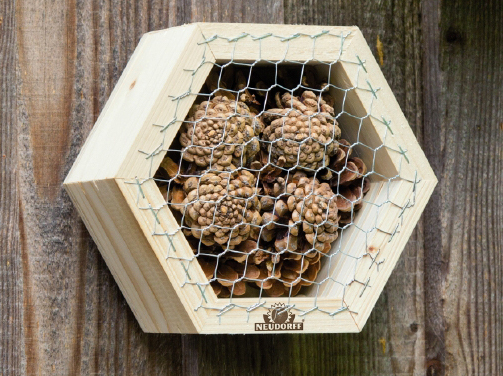 This type of nesting cell contains branches which have been drilled with holes to provide ideal nesting places for mason bees. These solitary bees, which are harmless to humans, ensure the safe pollination of fruit bushes and trees and thus encourage a good harvest. 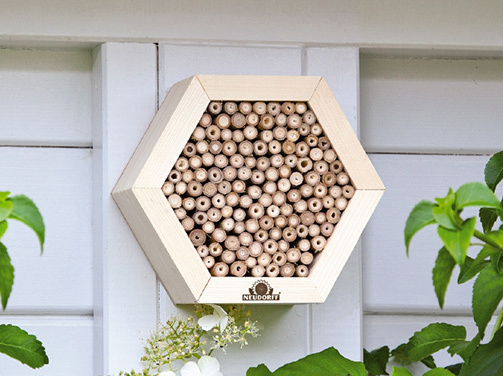 The third type of cell contains bamboo canes, which provide nesting places particularly suited to wild bees and digger wasps. While wild bees ensure effective pollination in the garden, digger wasps feed their offspring with aphids or leaf hoppers thereby contributing to biological plant protection in the garden or patio. Once you have found a sunny location, sheltered from wind and rain, the nesting cells can simply be hung on a wall. Whether in the countryside or a city centre apartment building, insects will be attracted to your insect flats and provide your plants with biological plant protection. 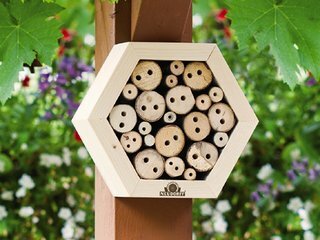 Adults as well as children will enjoy watching these beneficial insects when they arrive and build their nesting tubes, thereby receiving a practical lesson on the secrets of nature! If you want to attract these beneficial insects even more, it is important to offer them suitable plants. Many insects go through a stage where they feed on nectar and / or pollen but as a result of cultivation many flowering plants have blossoms that produce neither of these and are therefore worthless as a source of food for these visitors to your flowers. When is the best time to hang up the Insect Flats? You can hang up the nesting cells throughout the year, even in winter. If temperatures are mild enough, the first wild bees can start to fly as early as the end of February and will be happy to find accommodation. Even late in the year is a good time to hang up your Insect Flat as before the first frost sets in the last ladybirds will be looking for a place to hibernate. Is there any risk from the guests of the Insect Flats? No, on the contrary. The guests are useful because they help to destroy harmful insects, pollinate garden plants and enrich the biodiversity of the environment. Even wild bees and digger wasps are completely harmless and prefer to fly away rather than to attack. Our Insect Flats are also an excellent way of teaching children in nurseries and schools in a vivid and direct way how nature and its complex interactions work. What effort and care is needed to maintain the Insect Flats? Do I have to take the Insect Flats into the house in winter? Absolutely not! This would cause the insects to wake from hibernation, fly around your home and ultimately starve to death. You should leave the nesting cells where they are: insects have evolved over thousands of years to withstand low temperatures and will safely survive the winter. Many butterflies are welcome pollinators as adults. They enrich our gardens with their bright colours and are a symbol of an ecologically intact system. If you have some of the feeding plants for wild bees in your garden, pollinating butterflies will find the right food as well. 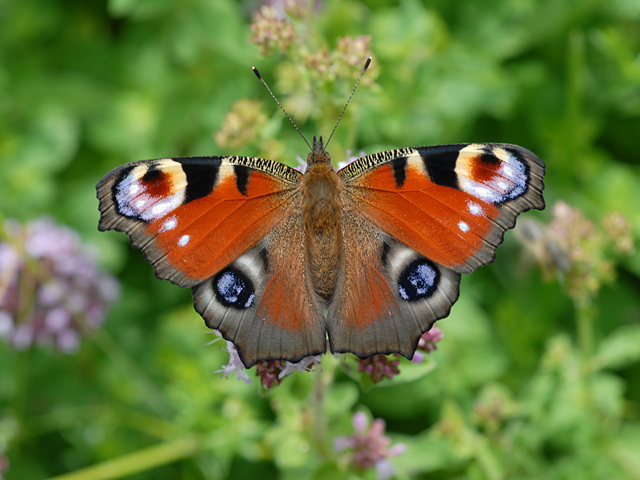 Some butterfly species like Admiral, Peacock and Comma hibernate as adults in our latitudes. They look for places protected from wind and rain, fold their wings together and don’t wake up from their winter dormancy until the next spring. Some butterfly species can produce a kind of "antifreeze" from glycerol, sorbitol and proteins. This way, they can lower the freezing point of their body fluids so much that they can even survive at temperatures as low as -20° C. Thus, the Brimstone butterfly can even hibernate without any protection, sitting on branches. 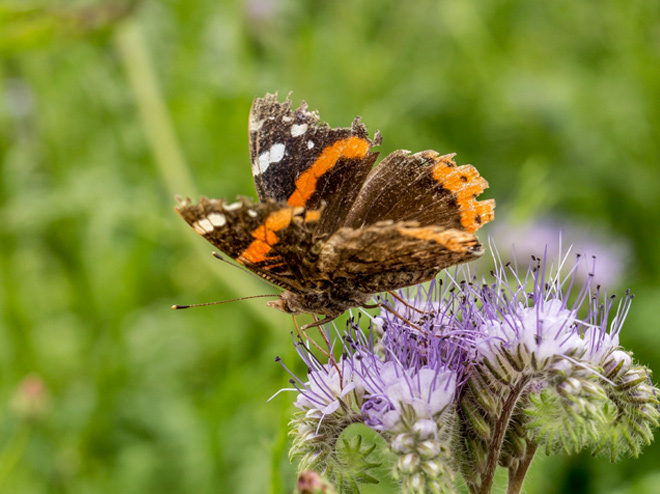 Most butterflies which overwinter as adult animals need a dry, protected area to hibernate. However, there are fewer and fewer hollow trees, old sheds and other places giving shelter. This is why Neudorff’s Insect Hotel offers a suitable alternative. In the central space of the hotel several butterflies will find their ideal hideout during winter. Probably the best known member of the ladybird family is the seven-spot ladybird - whose spots do not reveal his age, as is commonly assumed! Ladybirds are very beneficial garden inhabitants, which devour numerous aphids and serve as biological plant protectors. The adults hibernate on the ground, sheltered between leaves, moss and grass. Colonies of several animals that have joined for this purpose can often be found. 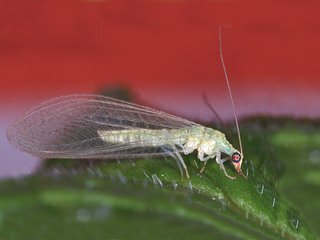 In spring after mating, a female can lay about 400 eggs on the undersides of the leaves of plants that are infested with aphids. 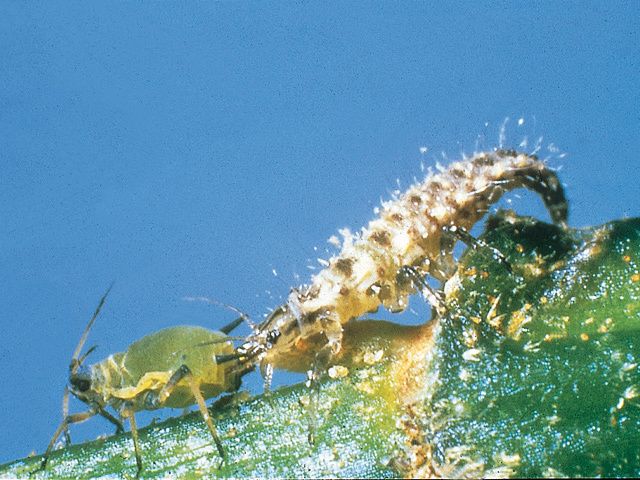 The hatching larvae feed on the aphids. In the course of their lives, a larva can consume approximately 400 aphids. After shedding their skin several times and going through pupation the adult beetle hatches, and the cycle begins anew. The development from egg to adult beetle takes one to two months. In one year, usually two generations occur. The adult animals can reach an age of approximately one year. In highly manicured gardens ladybirds find less and less sites for shelter and hibernation. They need just a layer of leaves or bark mulch on the ground, as otherwise they die of exposure during the cold season. In the dry pieces of bark in the Insect Hotel, they are at ease during the winter. Here they can find shelter from rain and wind and are also well protected from predators. The common green lacewing Chrysoperla carnea, also called Golden Eye, is a common and conspicuous beneficial insect in Central Europe. It feeds on aphids, thrips, mealy and wool bugs and other small insects to help you to fight pests naturally in your garden. The adult lacewings are crepuscular and nocturnal. These large green insects with their delicate wings often fly into houses because they are attracted by light at night. They feed mainly on pollen and nectar, which they find outside in flowers and blooms. Indoors, the adult animals usually can’t find any food. Here, they could only survive as a larva. A female lays 100 to 900 eggs onto about 10 mm long stalks. From these eggs, the larvae which are also called “Aphid Lions” will hatch. These greedy beneficials devour up to 400-600 aphids. They detain them with their long pincers and inject a digestive fluid. The result is that the aphid dissolves from the inside within a short time. Now, the lacewing larvae can absorb the liquid from inside the aphid. A larva lives about two to three weeks. Following, there is a pupal stage from which the adult animal hatches. The adult lacewings hibernate in Autumn and look for hiding places for this purpose in tree crevices, attics and shed. In summer they use these hiding places during the day, because they are active mainly at dusk and at night. In Neudorff’s Insect Hotel, they find ideal conditions for hibernation and shelter during the day both between the loosely stacked bark and the pine cones. Digger wasps live individually and do not form colonies. 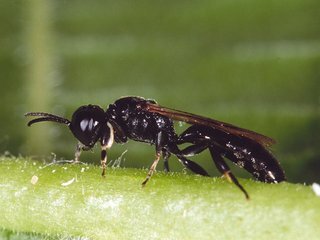 The habits of the various digger wasp species differ greatly from one another. Many species build their nests in the ground, while others nest in rotting wood or in hollow or pith-filled plant stems. What they all have in common is that they feed their larvae with insects. From species to species different prey is needed. Larger digger wasps have specialised in butterfly or beetle larvae, flies, bugs and grasshoppers. The smaller species often catch aphids, cicadas and thrips. These small species (<1 cm) are the ones that prefer nesting in the plant stems in the Insect Hotel. The adult digger wasps need nectar and pollen from flowering plants.